This code has been made in preparation for my book on Direct3D. The web versions of these samples will lag the actual samples for the book until the book is published. Simply put, its more important for me to finish the book than it is to keep this web site in synch with the latest changes to the samples. Once the book has been published, the most up-to-date versions of all the samples will be available at a web site through the publisher. Notes on the samples. Useful tools. You can also browse individual files in the samples. 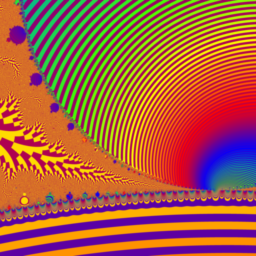 Based on the minimal application, this program computes a chaotic orbit in 2D and displays the orbit as color coded points. The chaotic nature of the orbit makes each painting of the window's client area slightly different, appearing animated. This can be a very simple way to experiment with an animated effect without coding timers or using multiple threads. Drag the window size handles and watch. 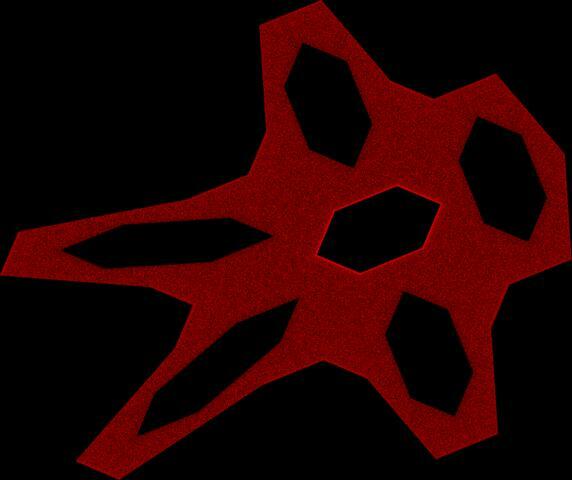 Source code for a minimal well-behaved Direct3D8 application that draws a single triangle in response to WM_PAINT messages. No, not "yet another set of wrapper classes around DirectX interfaces". Instead, this provides some generic utilities that are of use when writing Win32 C++ programs. This library has evolved from my personal efforts. Things that I find myself needing repeatedly go into this library. The library includes a mechanism for mapping unexpected COM failed HRESULTs to C++ exceptions, C++ standard library string classes adapted to TCHAR, and a few miscellaneous items. 19-Mar-2001: Use DXGetErrorString8 instead of D3DXGetErrorString. Include code fragment that generates the HRESULT in the failure message. (Suggested by Andrew Vesper.) Add uuid() support for D3DX and X file interfaces. Builds all the SDK samples in one workspace. Unzip the archive into the Direct3D sample directory. You will get two files: a VC++6 workspace a project. The project is a utility project that is dependent on all the Direct3D samples and tutorials shipped in the DirectX 8.0 SDK. The workspace contains the "rt_All" project and all the SDK sample projects. Open up the workspace, select the "rt_All" project, select a build configuration, and then build the project to get all the SDK samples built. Because this uses the project files as supplied in the SDK it doesn't build a library of the shared code, so it can take some time as each sample will compile its own copy of the shared framework. Note that this workspace doesn't include any sample or example programs I've written myself, only the Direct3D 8 samples distributed with the DX8 SDK. What's an application apprentice? Well its a code generator that's not quite smart enough to be called an Application Wizard, in MSVC parlance. The apprentice is a code generator, just like an AppWizard, but its just an extremely dumb code generator. All it knows how to do is make a new Direct3D sample from a template with your entered project name substituted in a few places. Included are templates for building a "minimal" D3D application as either a console application of a Win32 application, a screen saver based on CD3DScreenSaver, or a Visual Basic application based on the VB SDK framework. rt_Apprentice.hta is an HTML application (requires IE5 or later) that prompts you to select the application type. After selecting the application type you are prompted for the name of the new project and its location. The project name gets substituted into the template for the project type into new files for the project. Be sure to use a valid identifier for the project name (i.e. no spaces or other characters prohibited in identifiers) as the project name is substituted into pieces of code as an identifier in some instances. The generates projects a 'blank' and do nothing useful really. You must modify the generated code to make the project do something interesting, but it does get the boiler plate code out of the way. Note: HTML applications require the presence of IE5 or later. If you don't have IE5 installed on your computer, then you can carry out the apprentice's actions manually by copying the appropriate template directory to your new project directory and replacing $$BLANK$$ with your project name in the template files. 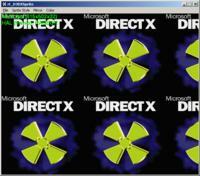 Sample based on D3DFrame, the boiler plate classes that Microsoft uses for their DirectX SDK sample programs. 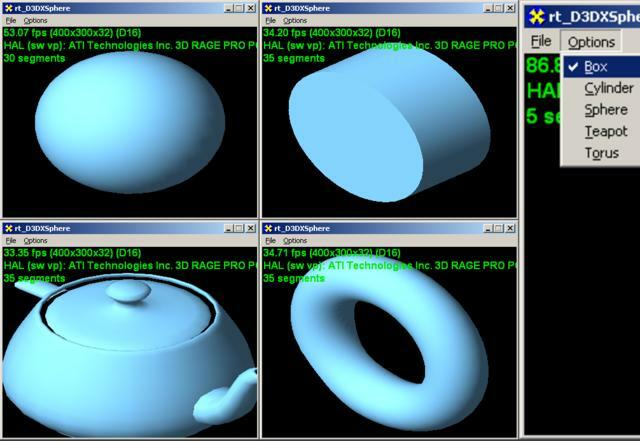 This sample was started by using the "New Sample Apprentice" below to generate a blank sample and then add demonstrations of D3DXCreateBox, D3DXCreateCylinder, D3DXCreateSphere, D3DXCreateTeapot and D3DXCreateTorus. Interactive control over the detail of the generated mesh is provided through the arrow keys on the keyboard. Unpack into your Direct3D samples directory (%DX8SDK%\samples\multimedia\Direct3D). It will create a subdirectory called rt_D3DXSphere containing the sample. 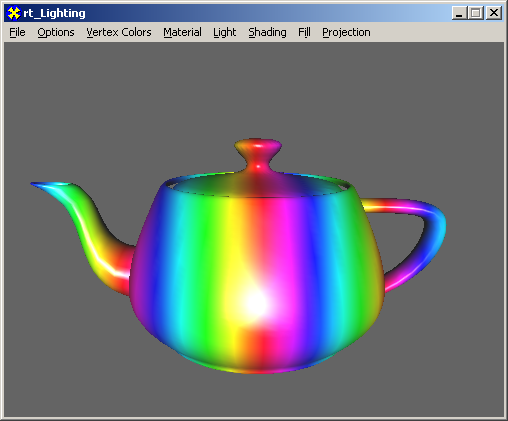 Demonstrates: device initialization, simple viewing, simple lighting, Z buffering, D3DXCreateBox, D3DXCreateCylinder, D3DXCreateSphere, D3DXCreateTeapot, D3DXCreateTorus D3DXMatrixLookAtLH, D3DXMatrixOrthoLH, ID3DXMesh, ID3DXBuffer, ID3DXMesh::OptimizeInplace. 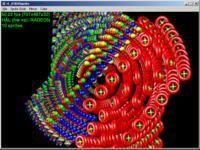 Demonstrates drawing 2D sprites with D3DX. You can display a sprite tiling the entire surface of the window and a dynamically rotating collection of sprites. Use the arrow keys to increase or decrease the number of dynamically rotating sprites. Use the menus to change the sprites that are displayed each frame, alter the color of the background, the sprite modulation color and the sprite texture's color key. You can also changing mirroring options for the tiled sprite. Try loading "donuts1.bmp" from the %DX8SDK%\samples\multimedia\Media directory to see color keying effects. Visualizes frame buffer processing: alpha test, stencil/depth test, stencil masking, stencil stippling, alpha blending (including blend modes using destination alpha), multisample antialising, multisample motion blur, multisample depth of field, dithering, and color channel masking. -nodest Don't use destination alpha. -nostencil Don't use stencil planes. Note: This sample was created with the DX8.1 SDK AppWizard. Updated 05-Mar-2002: rt_FrameBuffer now validates the blend modes used and disables any blending modes not supported by the device. Background and diffuse colors now allow unassociated alpha RGBA (i.e. R, G, B can be larger than A). Did you know that RGB(128, 128, 128) is not half as bright as RGB(255, 255, 255)? Surprise! Welcome to the world of CRT monitors and their non-linearities. LCD displays and printers also have non-linearities in their color response. For CRTs, the non-linearity can be modeled as a simple power function correlating intensity I with CRT voltage V to the gamma power. The use of gamma in this formula is why the process of compensating for the nonlinearity is called "gamma correction". Direct3D provides support for gamma correction directly in the GetGammaRamp and SetGammaRamp methods of the device. You can model a CRT's gamma as a single value for all phosphors or you can measure separate values for the red, green and blue phosphors. SetGammaRamp allows both techniques to be used. This program lets you interactively measure the gamma characteristics of your monitor, both as a single gamma value and as separate gamma values for red, green and blue phosphors. It also provides a test rendering that you can use to visualize the effects of gamma correction. 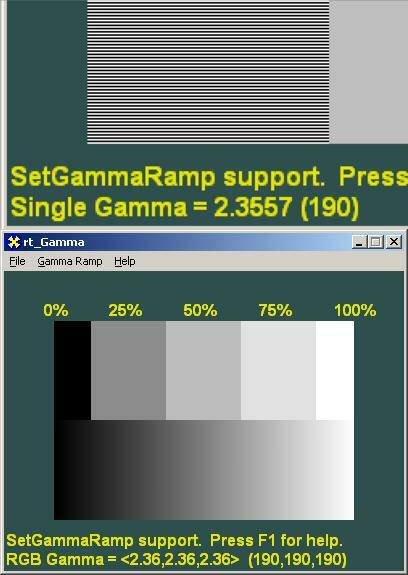 Demonstrates: D3DGAMMARAMP, SetGammaRamp(), technique for interactively measuring a monitor's gamma value, when to gamma correct yourself or let Direct3D do it, gamma test rendering, single gamma model, RGB gammas model, manual gamma correction. The gingerbread man fractal enhanced with D3DFrame. 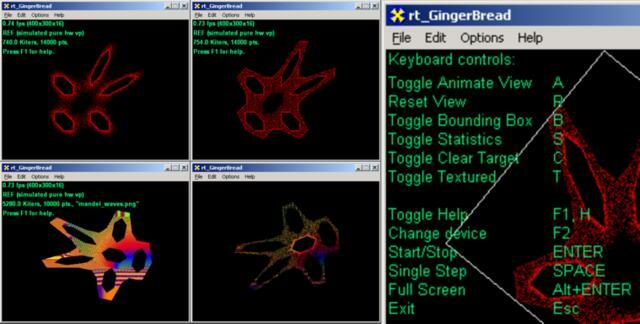 Unlike the 'minimal' style gingerbread man fractal above, this sample provides you with much more control over the rendering with D3DFrame: interactive device switching, a toggle from windowed mode to exclusive mode, start/stop and single-step the animation, FPS counter and other rendering statistics. Most of this comes from simply using D3DFrame's implementation of CD3DApplication. Extending CD3DApplication to provide more GUI elements is as easy as adding some menu items and a command handler. You can watch the its chaotic orbit in the plane as diffuse points or textured points. 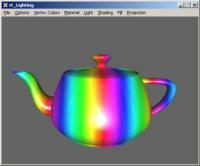 The points are rendered with alpha blending to allow them to accumulate to a dense image. The standard color chooser dialog is augmented with an alpha channel edit control, letting you edit all the colors used in the sample. On-screen help, bounding box toggle, view animation, status display toggle, foreground and background color editing. Demonstrates: diffuse colored points, texture creation, 2D texture coordinate generation, textured points, single stage texture setup, RGBA color picker with ::ChooseColor, accumulating renderings in the back buffer, locking and filling vertex buffers, world transformation, simple camera animation, IDirect3DVertexBuffer8, DrawPrimitive, DrawPrimitiveUP, ValidateDevice. Just for fun, compare your HAL device to refrast on the same settings. Are they the same? Visualizes lighting and material parameters and render states: D3DLIGHT8, D3DMATERIAL8, RS Ambient, RS Color Vertex, RS Lighting, RS Local Viewer, RS Normalize Normals, RS Ambient Material Source, RS Diffuse Material Source, RS Specular Material Source, RS Ambient Material Source, RS Specular Enable, RS Shade Mode, and RS Fill Mode. Simple dialogs let you change all the relevant material and light parameters and visualize their results on the Utah teapot. A program to dump out the contents of an ID3DXMesh object as returned by the D3DXLoadMeshFromX function. Shows you how to get at the face, index and vertex information for an ID3DXMesh by printing out information about the mesh to the debug output stream. 28-Feb-2001: Now uses the display format instead of x8r8g8b8 for the back buffer format that caused the CreateDevice to fail. Added workaround for VC++6 template weakness (see code comment in dump.cpp). Added a big comment at the top of dump.cpp explaining the data organization of a mesh. 19-Mar-2001: Fixed some ANSI/UNICODE build problems. Demonstrates the rasterization related render states RS Last Pixel, RS Edge Antialias, and RS Line Pattern. A scene consisting of a screen-space grid and a world-space circle is rendered with lines. To best observe the effect of RS Last Pixel, set the grid color to something less than fully opaque and use a pixel zoom utility to examine the intersections of the grid. The effect can also be seen where the lines forming the circle touch to complete the circle, but being only a single pixel it may be difficult to observe. Visualizes vertex blending used for ``skinning'', or making surface bend smoothly instead of rigidly. The result of vertex blending is highly dependent on both the transformations used in the blending and the distribution of the blend weights across the model. 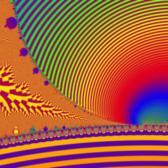 This is a modified version of the VertexBlend sample in the DX8 SDK. The SDK sample uses a text mesh and varies the blend weight along the x-axis of the mesh using a fixed weight distribution and transformation. This sample extends that to a variety of weight distributions and transformations allowing you to see how each influences the final result. "Sinusoidal" weight distribution and "Axis Rotation" are the settings used by the VertexBlend sample. Note: This sample was created with the DX8.1 SDK AppWizard. There are two differences with the 8.0 SDK that you will find if you attempt to compile the sample. The first difference is that the 8.1 SDK uses a different registry key to identify the location of the media files. You can adjust the registry key path in dxutil.cpp in the function DXUtil_GetDXSDKMediaPath. The second difference is that in the 8.1 SDK the function D3DXComputeNormals now accepts an adjacency argument. In d3dfile.cpp on lines 201 and 203, remove the NULL arguments to the function if you are using the 8.0 SDK. 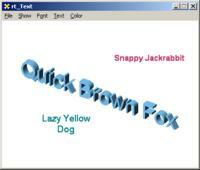 Demonstrates drawing text with D3DX. Screen-space text is drawn using ID3DXFont and CD3DFont. World space text is drawn as a mesh created as a 3D extruded character outline with D3DXCreateText. The menus let you change what text is displayed each frame, alter the color of the displayed text, and select each method's font. Try CD3DFont with an italic font and watch texels from leak across glyph boundaries. These samples were written with either the DirectX 8.0 or 8.1 SDK. If you want to use them with the DirectX 9 SDK, the 8.0 samples might need slight adjustments to a few functions here and there. The 8.1 samples should compile just fine with the DirectX 9 SDK, although they will use the 8.1 interfaces and not the 9.0 interfaces. All of this code assumes that you're using Microsoft Visual C++ 6SP4 or Microsoft Visual Studio.Net. My personal development environment is Windows XP Professional and Visual Studio.Net 2002. However, the code should build fine using ANSI settings on Windows 9x/Me. I use the TCHAR convention to avoid strings specific to ANSI or UNICODE. Any executable included is an ANSI build so you can try out programs on any of the platforms. (They aren't string intensive anyway.) You may need to modify the project configurations to compile in another environment. If for some reason the supplied executable does not work, try recompiling the executable from the supplied source. I have gotten some reports about the executables failing on some systems but I haven't been able to reproduce this. Most of these samples require the DX8 Direct3D sample framework in order to compile. 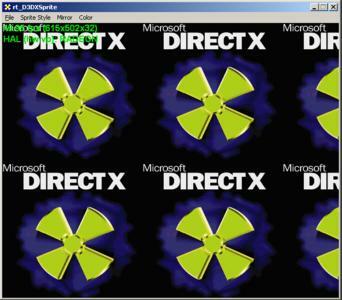 Make sure you unpack them into the samples\multimedia\Direct3D directory in your DX8 SDK. I've prefixed their names with 'rt_' so you can easily distinguish them from the samples that ship with the DX8 SDK. Paul Heckbert's zoom for all your filtering, resampling, resizing and mipmap generation preprocessing needs. All the thumbnails on this page were created with zoom. Windows Installer Tools for creating simple MSI based installations. ImageMagick for dealing with image file formats not handled by D3DX.